BriteVerify provides comprehensive verification solutions that improve email data quality, Inbox deliverability, and email marketing ROI. 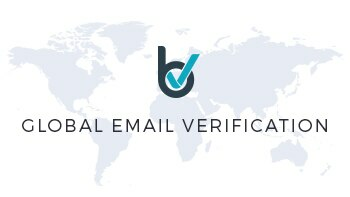 With over 20,000 users in 145 countries, BriteVerify is the global leader in email verification services. BriteVerify’s transactional APIs help companies collect better email addresses from their web forms and point-of-sale systems. Our list verification tools deliver both self-service and programmatic solutions that improve list quality and email campaign performance. Email Verification Ensures that an email address exists in real-time without ever sending a message. BriteVerify’s solutions help avoid email typo mistakes and list attrition that can impact Inbox delivery rates. Email verification improves list quality and delivers higher performing campaigns. Hundreds of servers deployed around the world. Geographically aware verification algorithms. The only service that is accurate around the globe. Real-Time Email Verification: Never turn a miss-spelling into a missed customer. Our Real-Time APIs and tools ensure data entering your systems is correct as a customer types. Real-Time Email List Verification: BriteVerify ensures that your existing marketing lists are clean and correct using the same technologies for a million emails as for one and we integrate with your ESP of choice.